The design was revealed as the national airline of the UAE rolled out the first of its ten A380s at the Airbus Firkenwerder facility in Hamburg. Created in partnership with leading brand consultants Landor Associates and drawing inspiration from Abu Dhabi’s desert landscape and modern architecture, Etihad’s new livery design will eventually be introduced across its entire fleet. The design pattern named ‘Facets of Abu Dhabi’ uses a colour palette which reflects the varying hues of the landscape of the UAE, from the darker sands of Liwa to the lighter colours seen in the Northern Emirates. The airlines A380 will begin flights to London Heathrow from 27 December 2014. The two subsequent deliveries of the A380 in early 2015 will also service the route, making it a triple daily A380 operation. 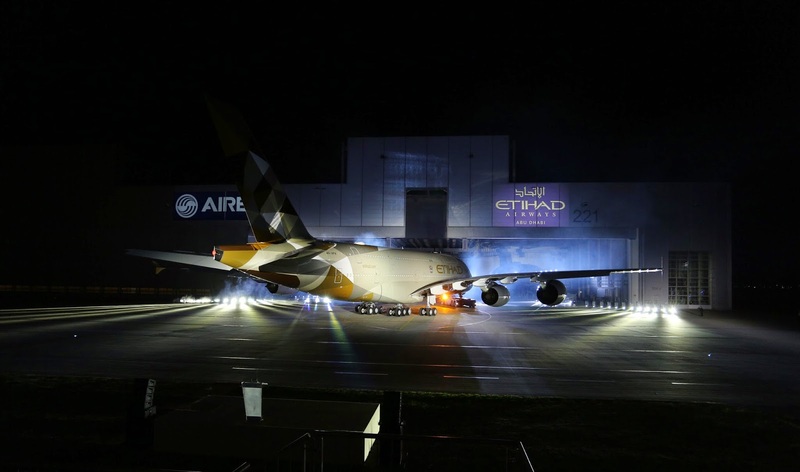 Later in 2015, A380s will operate flights to Sydney and flights to New York as Etihad Airways receives its fourth and fifth aircraft. What do you think of the new livery?